Final reports and results of our research can found throughout this site. But, because some of our work can span several years to gather information, review and summarize our findings, we want to keep you abreast of our current projects. Check back for updates on our progress. 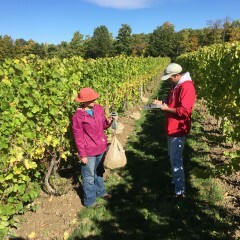 The Finger Lakes Teaching and Demonstration Vineyard, a partnership between the Finger Lakes Grape Program and Finger Lakes Community College, serves as a place for hands-on learning for students, growers, and the general public. It also provides us with an opportunity to compare an array of grape varieties planted side by side. Below are listed the average pruning weights for each of the varieties we have planted in the Teaching Vineyard. Here, you can see data on when each cultivar we have planted reached bud break, veraison, and harvest in the 2015 season.